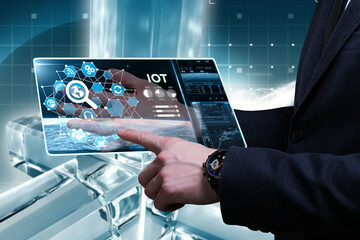 The Internet of things (IOT) is a network of devices that are connected to the Internet and can transfer data. These can be devices like home appliances in the form of a fridge, washing machine etc, even a camera, the television, etc. There are already many devices connected to the Internet and this number is estimated to reach approximately 30 million by 2020. The IOT makes it possible to sense and control the devices connected to the Internet remotely and hence has may applications. The Internet of Things consists of smart devices which are always connected to the World Wide Web. These devices communicate with other devices over the Internet by the process called machine-to-machine communication (M2M). It is possible for anyone to access the device manually and set it up however, most of the processing and analysis is done by the devices itself. There are many applications for IOT. It can be used by smart homes where many devices in the house are connected to the Internet. This includes devices for security like cameras. It also includes the home appliances like fridge, washing machines, air-condition, etc. Besides which it has many other applications like in hospitals to monitor heart implant and other medical devices. It can also be used by firefighters to assist them during emergencies. There are many applications for media as well, were it is possible to monitor the user preferences for programs and target their advertisements. IOT can be used for the purpose of Infrastructure Management to control urban and rural infrastructures like bridges, railway tracks, farms and more. There are also many applications for ships and ports and waste management. Alakmalak is involved in IOT Web Development and has many skilled and experienced developers for the task. These developers use the state of the art resources at their disposal. Hence, if in need to hire dedicated developers India Alakmalak is the best option. How to Change Number Of Upsell Products in Magento?